Thallus: umbilicate, mono-or polyphyllous (lobate), thick, rigid, +circular to somewhat irregular in shape, with a +perforated margin, 1-4(-10) cm in diam. 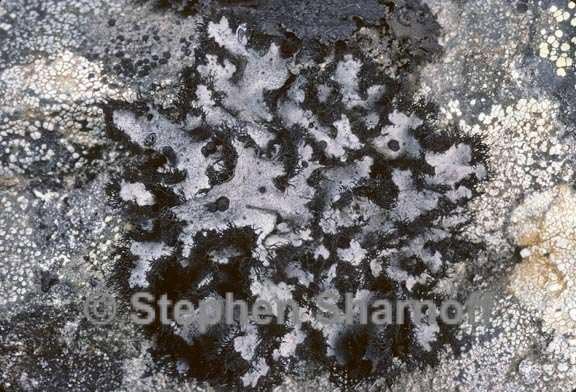 upper surface: light gray to medium gray (but brown beneath pruina), smooth, with black ciliate margins medulla: white lower surface: ivory to pink, sometimes brown towards the umbo, smooth to minutely granular, scattered with white, branched rhizinomorphs Apothecia: common, black, stipitate, gyrodisc, 1-3(-4) mm in diam. asci: clavate, 8-spored ascospores: hyaline, simple, ellipsoid, 7-15 x 4-7 µm Spot tests: medulla K+ red or K-, C-, KC-, P+ orange or P- Secondary metabolite: norstictic acid. Substrate and ecology: on siliceous rocks, usually in the alpine vegetation zone World distribution: Europe, Asia, and North America Sonoran distribution: rare, eastern Arizona. Note: Umbilicaria cylindrica is very common in other alpine areas in the Northern Hemisphere, but is rare in the Sonoran region. Among the Sonoran Umbilicariae, the presence of marginal cilia in U. cylindrica is unique.